Moving on with our series on state solar incentives and facts, below are Colorado solar incentives for the residential and commercial sector, followed by some fun Colorado solar energy facts. Enjoy! Sales Tax Exemption: Sales, storage, and use of renewable energy systems is also exempt from the Colorado sales and use tax. This applies to solar water heat, solar space heat, solar thermal electric, solar thermal process heat, solar photovoltaics, and other renewable energy technologies. Counties and municipalities may also offer property or sales tax exemptions or credits. Direct Lending Revolving Loan Program: For commercial, industrial, or nonprofit renewable energy projects, there is also the possibility of getting a loan for $100,000 or more thanks to the federal American Recovery and Reinvestment Act of 2009. Overall, there are a large number of Colorado solar incentives. If you live in the state, you should take advantage of them! There are currently more than 341 solar companies at work throughout the value chain in Colorado, employing 3,600. 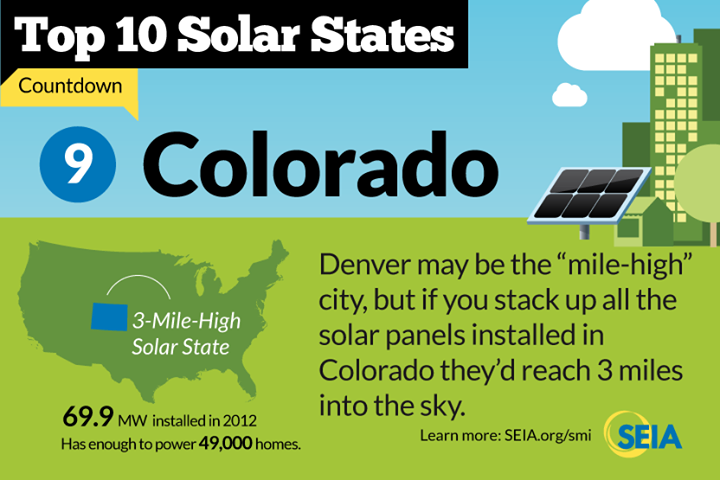 In 2012, Colorado installed 70 MW of solar electric capacity, ranking it 9th nationally. The 298 MW of solar energy currently installedin Colorado ranks the state 6th in the country in installed solar capacity. There is enough solar energy installed in the state to power 53,600 homes. In 2012, $187 million was invested in Coloradoto install solar on homes and businesses. Average installed residential and commercial photovoltaic system prices in Colorado fell by 25% last year. National prices have also dropped steadily— by 11% from last year and 34% from 2010. Average 20-year savings from going solar in Colorado are projected to total around $25,000, while internal rate of return (IRR) is projected to be 15%, even beating the S&P 500 and 30-year US Treasury Bonds. Impressive!